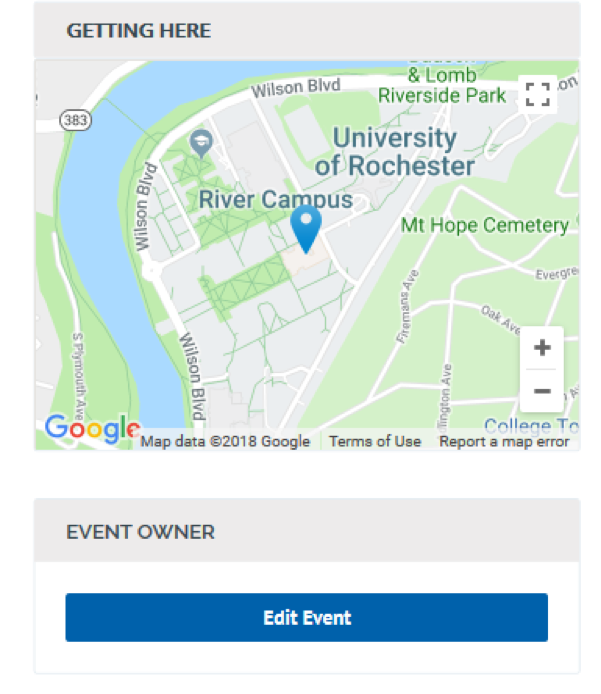 The University of Rochester Events Calendar is the place to discover a variety of events at all campuses, including the River Campus, Eastman School, Memorial Art Gallery, and Medical Center. The calendar features events organized, hosted, sponsored, or cosponsored by University departments, colleges, centers and institutes, organizations, and officially sanctioned student organizations. Events may be open to the general public or private events for faculty, staff, students, and alumni. They may also be hosted on-campus or off-campus, but must be located in the Rochester area. University Communications reserves the right to approve, reject, or make special considerations for any event submitted to the calendar. The calendar does not accept event submissions from individuals or organizations from outside of the university, with the exception of conferences or non-university events that are held in University venues. Personal events or solicitations are not permitted. The University Events Calendar is powered by Localist and is a user interactive events calendar. Sign in to save, submit events, and to share events with friends. Create an account with your University NetID. Sign in directly at http://events.rochester.edu. Get email reminders about events you’re going to so you don’t forget about them. Tell your friends about upcoming events by sharing them on your Facebook wall. Share feedback and photos about the events you’ve attended. If you are the owner of the event, you should see and “Edit Event” button under the map (see image below). If you are not the event owner, contact localist@urmc.rochester.edu to request changes. Once you have made changes to your event, click save and your event will be added to the pending queue for reapproval.